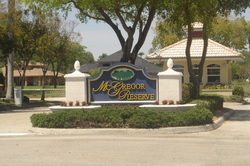 McGregor Reserve is a quiet neighborhood located off Somerset Drive, just a mile north of Colonial Blvd. The neighborhood has only 135 single-family homes ranging in size from 1,950 to over 4,500 square feet and has a variety of home styles to choose from. There is a gated entrance and 2 fabulous lakes. The streets are lined with mahogany trees and there are sidewalks and streetlights throughout the neighborhood. Community amenities include a resort style heated pool and clubhouse. With its close proximity to downtown and great restaurants, shopping, & entertainment, it is difficult to find another community like McGregor Reserve.